In 1911, card-punching and electric tabulating machinery revolutionised statistical compilation. The machines required expert supervision and were expensive, but they added a range of analysis and great savings in time and costs. The Dominion Statistician, Herbert Marshall, wrote in his annual report for 1955/1956, "Much study is being given to the question of adding an electronic computing machine to the Bureau's mechanical equipment." 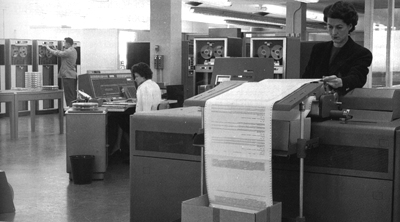 The 1960/1961 Annual Report noted that for the first time an electronic computer would be used to compile data for the Census. This eliminated the need for intermediary punched cards. The Bureau's first in-house computer was the IBM 705. In its day, it was one of the biggest computers in Canada. It began arriving in July 1960: the 705 was not one piece of equipment, but rather a number of machines working together. The 705 occupied an entire wing of the Bureau's Main Building, and the ceiling had to be rebuilt to house the cables. The heat generated by the computer's 10,000 vacuum tubes had to be offset by two large air-conditioning units. A staff of 30 worked directly on the computer. By 1966, the Dominion Statistician reported that "the computer resources continue to be used virtually at capacity—24 hours a day during a five-day week, with considerable overtime on weekends." He noted that "a systematic study is under way to establish long-term computer requirements in the Dominion Bureau of Statistics as the basis for plans to replace some of the existing equipment which is becoming obsolete." By 1968, CANSIM (the Canadian Socio-Economic Information Management System)—originally a data storage, retrieval and manipulation computer program—contained a meagre 2,500 time series. Twenty-five years later, it had grown to over 400,000, still only a fraction of the agency's total time series it contains today. Online service to CANSIM was introduced in 1972, first to federal government users and a year later to the general public. In 2008, CANSIM celebrated its fortieth anniversary as the agency's primary database for Canada's socio-economic information. In the 1990s, the Internet revolution and the growing popularity of this new technology, combined with the increasing demand for micro data, paved the way for Statistics Canada to respond to data users' needs with an extensive Internet site, public-use micro data files and a network of research data centres. The Statistics Canada website was launched in 1995, marking the beginning of a new era. Since then, the website has become the main communication and dissemination channel for Statistics Canada. With its seven million pages of news releases, in-depth analytical studies, articles, technical papers, data tables, etc., it is one of the largest websites in the federal government.